Don’t miss out: Keep up-to-date with the STABILUS Safety Newsletter. Its high shaft makes the difference! Based on our successful 3660 L winter boots model, STABILUS Safety has now developed the 4340 L, which offers extra stability and protection thanks to its high laced shaft, which protrudes clearly above the ankle. 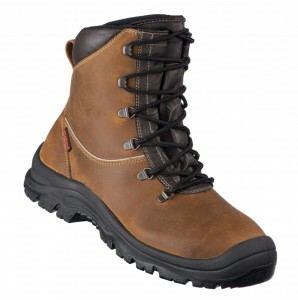 This distinguishes the 4340 L from other standard safety boots, which usually stop just above the ankle. It needs to be emphasised here that the high lacing and dust flap make sure that stones and similar objects cannot penetrate the boot. The 4340 L is a sturdy leather boot that comes with a natural orthopaedic lining. The insole is made of a non-metal, puncture-resistant fabric, and the anatomically shaped insole is also washable. Quality that certainly pays off! The first batch is now in stock. Place your order today and be one of the first in the market to gain an advantage. Simply get in touch to order! Peak season for anyone working with wood is the time between autumn and spring. That said, cut resistant boots are popular at any time of year, with forest workers wearing them for other work, as well, such as fencing, planting and clearing away storm damage. Did you know that forestry law is state law in Germany? And, although the German Federal Forest Act (BWaldG) exists, it merely represents a legal framework within which the federal states can define their own regulations. This means that no standard regulation exists governing when you can work in a forest. In this sense, a legally defined season does not exist. Our 3902 cut resistant boot is currently in high demand. The fact that it complies with Cut Resistance Level II, thus meeting the requirements of forestry offices, is obvious. Stocks are already very low for some sizes. We therefore recommend placing your order quickly so that you can meet your customers’ demand. Simply get in touch to order. Already know what’s coming up? The PSA Regulation, which is correctly known as Regulation 2016/425 for PPE Products, is due to come into force on April 21, 2018. It will gradually replace the existing Directive 89/686/EEC for PPE products and represents a commitment for manufacturers and distributors. The PPE has important implications for key aspects, such as certificate validity, deadlines, verification obligations for retailers, information requirements for manufacturers and more. April 21, 2018: PPE Regulation 2016/425 enters into force with a transitional ruling. From this date onwards, EC type-examination certificates can only be issued in accordance with the provisions of Regulation 2016/425 for PPE products. Existing EC type-examination certificates that comply with Directive 89/686/EEC do still retain their validity, however. April 20, 2019: End of the transitional period for issuing EC type-examination certificates. Last day on which EC type-examination certificates can be issued in accordance with PPE Directive 89/686/EEC. April 21, 2019: From this date, EC type-examination certificates for PPE products are no longer allowed be issued based on the PPE Directive. Manufacturers are only allowed to market new PPE products that comply with Regulation 2016/425 for PPE products. April 20, 2023: This is the expiry date for all PPE-compliant certificates, the last day on which corresponding PPE products can be placed on the market. April 21, 2023: Only certificates are valid which comply with Regulation 2016/425 for PPE products. Please note that the PPE Regulation applies throughout the EU, although special rules do apply for individual member states. Since the implementation of the PPE Regulation is currently underway, some components may still change. This applies specifically to the question of how to interpret some aspects of the PPE Regulation.